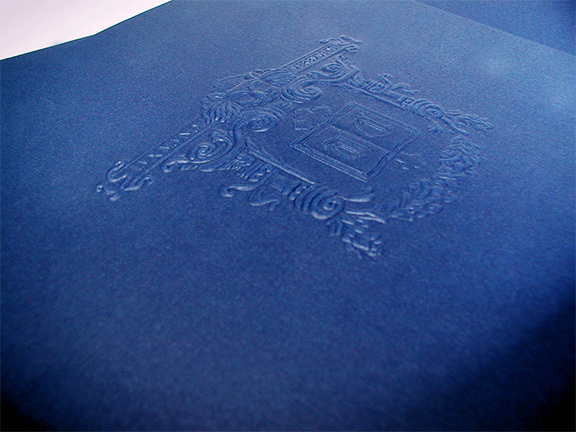 The use of embossing can be the perfect addition for a printed product incorporating a subtle and sophisticated finish. Using a female and male metal die called a counter, or metal plate, precise and permanent impressions are created by applying pressure and heat which raises or lowers an image or text element through the paper. The emboss area is not being inked by this process, as ink is applied before this embossing process. Embossing can be exceptionally interesting when the emboss is done as a blind emboss, meaning the raised and lowered areas of the paper show the image or text without the aid of ink. Shadow, highlights, and paper emphasize this unique and special finishing technique. Various types of embosses: There are single level, multi-level, sculptured, and many more types of embossing dies available. Ask one of our production managers if you would like to learn more, or visit our news section. Paper has a major factor: The type of paper is important when determining an emboss structure. Heavy coated paper may crack or stretch under the pressure of the emboss. An uncoated cover stock 80#-110# is optimal when considering an emboss. Paper sample books are great resources: Paper technique and mill sample books offer great visual resources. If you spot something that you like, we can duplicate the process with our equipment on location. Submitting artwork for an emboss: A vector line drawing should be submitted to us as well as the photograph if you wish to emboss an area. Logos and text can be extracted from submitted vector artwork. Typography Spacing: When using a deep emboss, type should be spaced more than usual to ensure the letters are readable and legible. Wrinkles and distortions may occur if an emboss is too close to the paper edge. 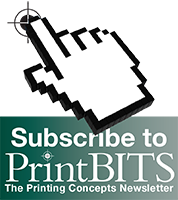 We recommend a 1/2″ – 3/4″ space to the paper edge. As heat is applied, the paper naturally becomes smoother. Controlled scorching of the paper may create a polished look for added effect. Scorching for a polished effect is when the embosser adds extra heat to the plate, and can only be done with a blind emboss. Emboss dies may take a few days to create, it’s time saving if you send a die first before final designs are sent to the printer. We create an emboss with the grain of the paper to avoid many common paper issues. An emboss with a clear gloss varnish over ink will create a high-gloss effect with uncoated paper. Light colored paper will show more shadow while a scorched dark color will use highlights for emphasis. Although embossing is not intended for every product, it does create a sense of subtlety and beauty when used appropriately. Our team of printing professionals are happy to answer any questions you have about the embossing process, and any other specialty printing process. We have sample books on stock if you have any additional questions.